We provide answers to you most Frequent Questions. We repair all Smartphones, iPhones, Tablets, iPads, Laptops, MacBooks, PCs, iMacs, Game Consoles and TVs. In our stores, most of the repairs are completed just within 20 minutes, right in front of you. When having to deal with more demanding repairs we make sure to complete them as soon as possible, depending on the parts availability. If it is not possible for you to make it to one of our locations, you may use our free pick up and return service, available nationwide. We only use 100% genuine OEM parts, where possible. I have multiple issues with my device, can I get a deal on multiple repairs? Yes, we offer up to 100% discount for 2 or more repairs performed on the same device. Is there a charge for the pick up and return service? No, we offer this service for free nationwide, offering pick up and return to your location. What should I include when I hand in my device? We only need your device and the completed “Pick up Service form”. You do not need to include accessories or the original packaging. Do I have to include my passcode? It is recommended. We need the passcode in order to test your device after the repair. If you do not wish to provide your passcode, certain phone functions won’t be tested such us camera, Wi-Fi, and Bluetooth, and therefore can’t be verified by us to work. Do not turn on your device. It’s best if you bring it the next day or even the same day, as we will have a better chance of repairing it. Of course if you can’t make it to one of our locations, try to dry it out, then use our free pick up service to send your device to us. Water damage repairs generally take between 1-3 days to complete depending on the level of damage. This estimate can vary, however, depending on the extent of the damage to the logic board and other components. Yes, any non responsiveness your phone is suffering due to a drop will be corrected with the Glass & Digitizer repair, leaving the LCD intact. If the actual screen of the phone is bleeding, white/black, or has any dead pixels then you’re going to need to select the LCD & Glass option as the LCD has suffered irreversible damage. Still not sure? 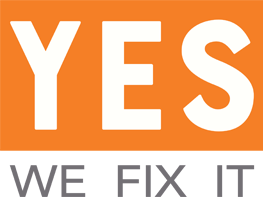 Send a picture of the current condition of the phone while it is powered on to info@yeswefixit.gr and we will do our best to diagnose it. The glass on my Phone is completely shattered and is chipping off, is the glass replacement service all I need?